PJs from Vintage Sheets - Super Mom - No Cape! Our middle daughter has been coming to stay on the weekends and this past weekend she had Friday off making it a three day weekend for her. On Thursday morning, she texted me to say that time had gotten away from her and she hadn’t been able to pack that morning and wouldn’t have time to go home after work, pack and still make it to her bus on time, so she would be coming with the clothes on her back. We decided we would hit the thrift stores on Friday to shop for jeans/shorts and t-shirts to wear for the weekend. But then later in the morning, I realized that she’d need some pjs for Thursday night. 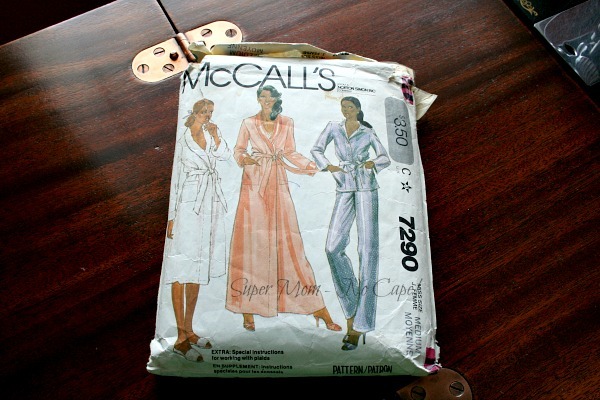 So I looked through my pattern box and came up with this old McCall’s pattern. The pattern is circa 1983. I used it to make the housecoat to wear on Dave’s and my honeymoon trip to Hawaii. And it was used again to make housecoats for each of our girls the year they went off to university in Canada. I’d never used the pants pattern from it but it only took a few minutes to cut out. 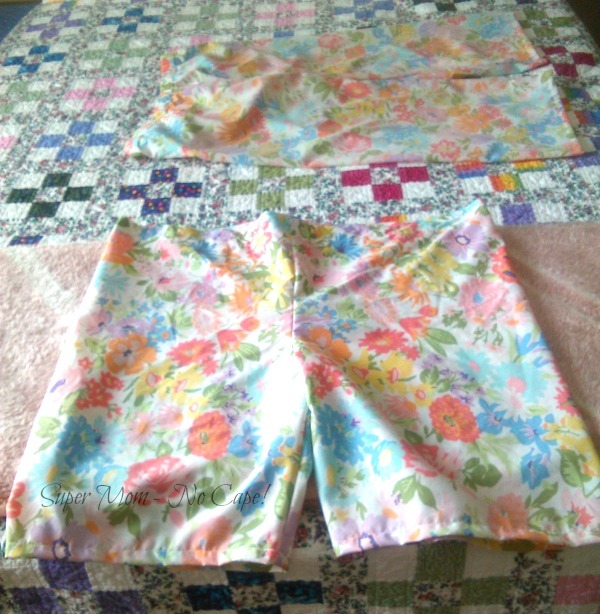 Then I searched through the drawer in my fabric dresser where I keep the thrifted sheets I’ve bought over the years and found a vintage single sheet that had been washed to a wonderful softness just right for making comfy pj pants. A couple of hours later and these were almost ready for her to wear. All they needed was to have the elastic adjusted to fit her waist and then the casing sewn closed. 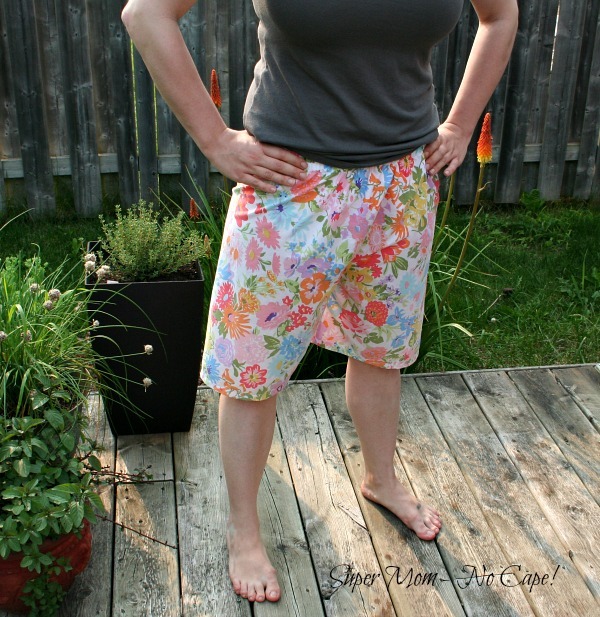 There was even enough of the sheet left over to make her a pair of pj shorts. 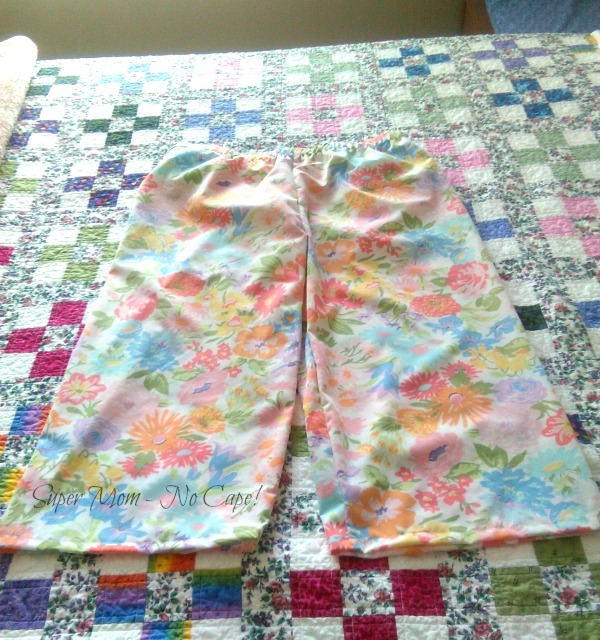 I only had enough 1 inch elastic for the pants, so for the shorts, I sewed a double casing channel and used two lengths of 1/2″ elastic. Both sets were finished well before bedtime on Thursday evening. Great job! Hope y’all had a lovely weekend! Very cute and I’ll bet they are super comfortable too. These are awesome! What a great idea to use vintage sheets. 🙂 Reuse is better than recycle, and you actually upcycled I guess! She’s lucky to have you for a mom! Those are cute, both of them. Who needs to pack when your mom can make you what you can’t find at the thrift store? Gorgeous pjs! 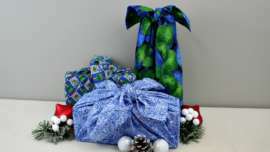 I laughed when I saw the photo of the pattern you used… I have the exact one in my pattern box (with a similar family history). That’s a great use of vintage sheets! My goodness, that’s a really quick turnaround! What pretty sheet fabric. Those pj’s look very comfortable. The PJ’s turned out darling! How fun! I made the girls some nightgowns out of vintage sheets this summer. They’ve practically lived in them. I’ll email you a pic if I can figure out how. How useful to have a mum with a sewing machine and a handy stash of vintage sheets! 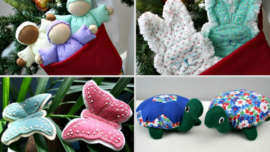 You’re a clever mom – now she has a couple of designer items and, better yet, they’re made with love. Thrifting is the best (as we just returned from picking up 7 ‘new’ pairs of shorts and couple of little shirts for our grandson…all for the princely sum of less than $30). 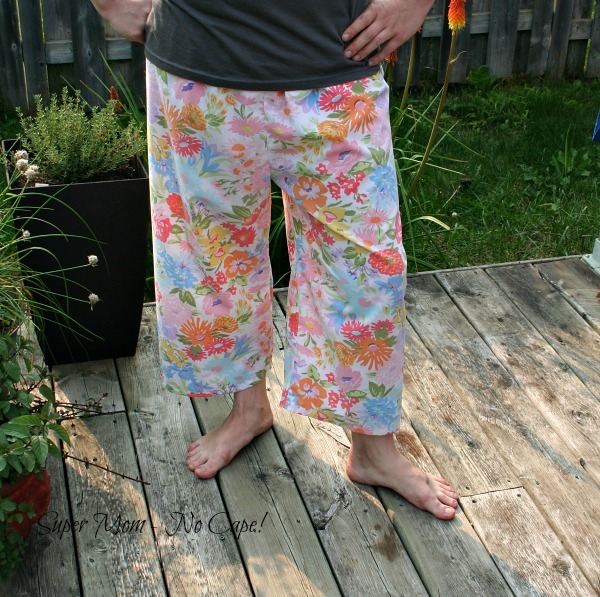 These must be the best jammie pants ever Susan! 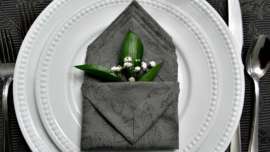 I’m sending your post to a friend who is mad for vintage sheets. I just had to pop by and say hello after seeing the name of your blog… Love it! And thank you for your visit from Let’s Bee Social too! Oh I love that ‘fabric’! Our thrift store is pretty small so we don’t get really great finds like that very often. But I’m going to search a little harder next time and see if I can find some lovely sheets as well. The pj’s look fantastic! Those pants and shorts turned out perfect! Love the floral. I wear pajamas all the time while sewing. I love these! What a great use for vintage sheets. I’ll bet they’re really comfy, too. I miss percale. Peter Lappin at Male Pattern Boldness (http://malepatternboldness.blogspot.com/) uses vintage sheets to make clothes all the time, including pants! Maybe your daughter is up for a whole “new” wardrobe! Wonderful idea! Maybe she should leave one pair at your house for the next emergency. Or let you make another pair. Pretty smart to use vintage sheets that are already softened. Super Mom, indeed! Oh how wonderful! What a beautiful vintage sheet, it makes the perfect summery PJs!